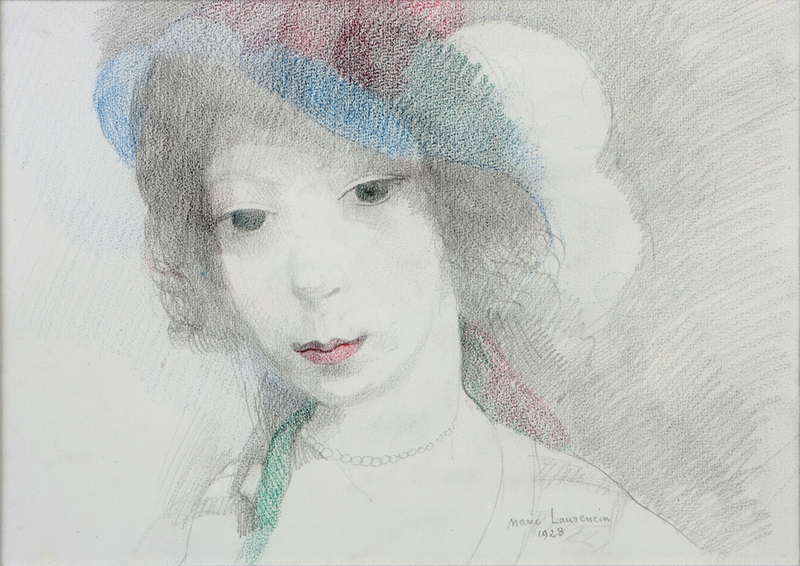 Influenced by artists and poets alike the work of Marie Laurencin combines both realism and fantasy. Encouraged by her friends Georges Braque and Pablo Picasso, Laurencin developed a personal style and fresh, refined palette. Her paintings are almost exclusively of graceful, mysterious women frequently bedecked with pearls, playing a musical instrument or accompanied by faun. Although originally trained to be a decorator of porcelain at the Sevres factory, Marie Laurencin took lessons at the Académie Humbert in the early 1900s and in 1907 was introduced by Picasso to the poet Guillaume Appolinaire with whom she had a five year affair. During this period she encountered the most famous artists and writers of the day and her painting entitled Group of artists, depicting Apollinaire, Picasso and his mistress Fernande Olivier, and herself, was purchased by Gertrude Stein in 1908. The failure of her relationship with Apollinaire in 1913 signaled the end of her Cubist period but she still maintained strong ties with her artist friends and in the same year she met the art dealer Paul Rosenberg and joined Matisse, Picasso and Braque as one of his artists, a relationship that was to last until 1940. Following a brief exile in Spain, Marie Laurencin returned to Paris in 1921 and for the next three decades continued to paint, write poetry and design sets and costumes for the theatre and Ballet Russes. She became a popular society portrait painter and her sitters included Coco Chanel, Helena Rubinstein, Emerald, Lady Cunard and Madame André Derain. Marie Laurencin died in Paris in 1956; she was buried in a white dress holding a rose in one hand and a love letter from Guillaume Apollinaire in the other.